Each month a sign made from recyclables is placed in front of a business that has made efforts to beautify Miles City. The efforts of these businesses are greatly appreciated by KMCB and the residents of Miles City. Thank you to LaCasa Diamonds for beautifying downtown Miles City! 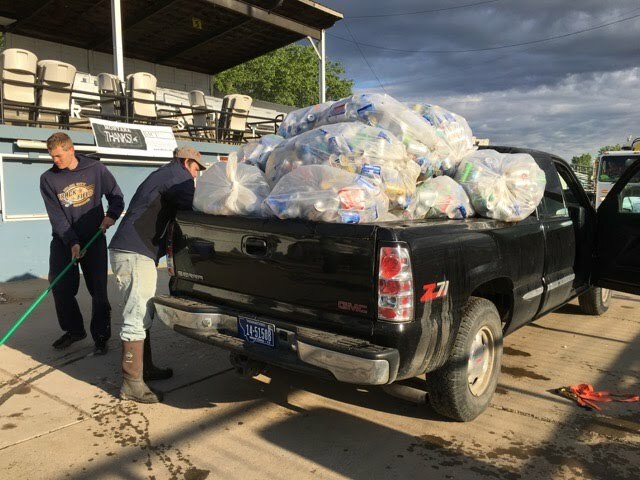 Keep Miles City Beautiful helps EMI with the Bucking Horse Sale Recycling. Pictured is KMCB board member and volunteer, Brady Patch, strapping 22 bags of recycling onto his truck. The mission of KMCB is to engage community members to improve and beautify our environment through recycling, litter control, Beautification and education. Call for volunteers! Several neighborhoods are open for adoption. Supplies, including gloves, trash bags, trash grabbers, safety vests, water and snacks provided by WalMart will be available at the park. 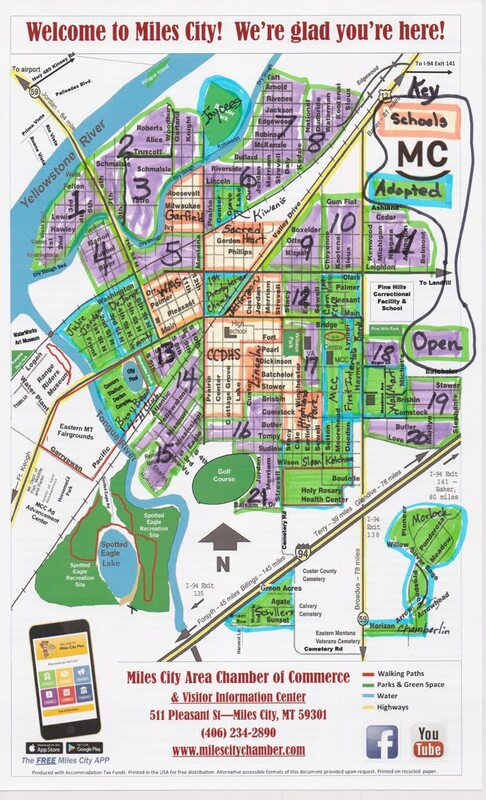 You may sign up for a neighborhood in advance or be assigned a neighborhood or a task when you come. If you want to help but are not available to work at that time, call, text or email to make arrangements to get supplies. Thank you in advance, for Keeping Miles City Beautiful! You are welcome to download the form, fill it out, take a picture with your phone and send it in a text. Contact: Sue Stanton Morlock, call or text 951-0967 or email sstanton@midrivers.com. Do you own a vehicle that won’t run and you have no way to dispose of it? Good news! These vehicles can be reused or recycled. An eyesore in your backyard could become cash in your pocket. Help is a phone call away! You can call these local businesses for quotes and to see if you qualify for free towing. Border pays for vehicles that they crush for recycled steel. Vehicle owner is responsible for removal of fluids prior to towing. Northside uses the vehicles for parts. Vehicles are hauled to the Northside property and once usable parts have been removed, they are crushed for recycled steel. Removal of fluids from the vehicles is not required. Northside will donate $20 to KMCB for every referral so be sure to mention us if you use their service! Thank you for keeping Miles City beautiful! 20 recycle bins are now available to residents of Miles City. The bins were installed at the end of June. 42 bags of recyclables have been collected to date. Keep Miles City Beautiful board members have been collecting and delivering the cans and bottles to EMI. This is another advantage of being an affiliate of Keep America Beautiful. Many of our ongoing projects, including Adopt a Pot, were created as a result of start-up grants administered by Keep America Beautiful. Keep Miles City Beautiful, in November 2010, became an affiliate of Keep America Beautiful, the nation’s largest nonprofit community improvement and education organization. KAB believes that we each have an obligation to preserve our communities. Through the work of individuals, we collectively have a huge impact on the world. Volunteers are needed for cleanups April through October and for America Recycles Day in November. The Adopt-a-Spot program appreciates groups and families who adopt designated sites for cleanup. KMCB volunteers participate in a host of ongoing and one-time projects in Miles City. Activities include Adopt-a-Pot, Adopt-a-Spot, Bucking Horse Sale and Fairgrounds Recycling, Great American Cleanup and more.